Hristo Botev was born on January 6, 1848 in Kalofer. His father, a teacher and one of the most significant figures in the late period of the Bulgarian National Revival, sent him to high school in Odessa (modern Ukraine). There Hristo was very impressed by the works of Russian liberal poets and wrote his first poetic works. On return to Kalofer, Hristo made a public speech against the Ottoman Empire and the wealthy Bulgarians, which made him leave Bulgaria for Romania. Botev greatly influenced the Bulgarian revolutionists and became editor of the newspaper World of the Bulgarian Emigrants. He closely collaborated with the Russian revolutionists and worked for the Russian newspaper Svoboda (Liberty). 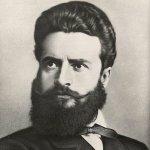 Hristo Botev was killed on June 1 during the April Uprising. After his death his revolutionists suffered morale drop and began to disperse. Botev's day of death was proclaimed a memorial day in 1885. Every year exactly at noon on June 2, air raid sirens across the country for a minute, that honors Hristo Botev and all people, who died for freedom of Bulgaria. People stand still for 2-3 minutes till the sirens are stopped.